If you’re trying to decide on the right schooling for your child, and you’ve come across Montessori and don’t quite know what it entails, or why it would be the best option, here are some reasons for enrolling your child in a Montessori school. It prepares your child for primary school with advanced learning skills by providing the bridging skills needed for school readiness and to excel in that next environment. It establishes a sound foundation of early life skills which are necessary to be suitably equipped for modern day life. Research studies show that Montessori children are well prepared for later life, academically socially and emotionally. They score well above average showing responsibility, enthusiasm for learning and adapting to new situations – all of which are crucial outcomes if a child is to be appropriately equipped for coping with the challenges of fast paced modern day life. Practical life skills are learnt in a nurturing environment. Think of all the simple routine tasks which adults perform each day, such as getting dressed and washed, preparing food, setting and clearing a table at meal times, washing up and generally cleaning and tidying the house. These are all practical life skills. The crucial difference between the view of the adult and that of the child is that, whereas the adult is interested in the end result, a child is fascinated by the activity itself. Children are keenly interested in these activities and want to learn them- this is the child’s way of adapting to the world around and constructing reality. A Montessori education includes specifically formulated activities which impart practical life skills in a nurturing environment. Scientifically designed specific materials are used to facilitate learning and develop muscular co-ordination. Materials are child sized yet functional. The materials help develop the child’s muscular co-ordination and some prepare their muscles for later specific tasks such as writing. Exercises are therefore activity based to suit the needs of children in the 18 months to 5 year age group. In particular Montessori emphasises learning through all five senses and not only through the more traditional approaches of listening, watching and reading. Each child is allowed to develop at their own pace which promotes independence and self-reliance. In pursuit of this end, learning materials and exercises contain a control of error so that children may correct their own mistakes and guide themselves towards successful and independent completion of tasks. This own pace approach permits children to attain levels far ahead of their age if they choose, or have the ability to do so. 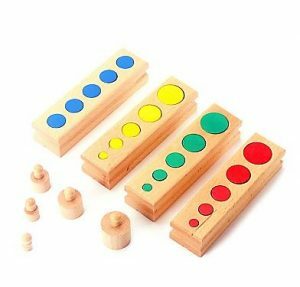 Underpinning this approach, the Montessori teacher acts as a facilitator and guides the child ensuring however that the child’s sense of independence and self-reliance are developed and nurtured. Spontaneity and individuality are encouraged. In terms of this teaching method learning is seen as an exciting process of discovery for the child leading to the development of concentration, motivation, self discipline and a love of work. A Montessori education apart from establishing a robust foundation for future academic learning will provide a nurturing environment in which your child is free to develop his/her own identity. Vocabulary development is enhanced. Your child is taught the specific language for the new experiences that he/she acquires within the Montessori environment and consequently vocabulary development is enhanced. Social and emotional development is fostered. A typical Montessori classroom is orderly, clean and inviting. Children take an active part in caring for their school and each other and therefore learn to respect their environment, their peers and adults. The holistic Montessori approach aims to prepare children to impact their environment positively throughout life as valuable members of society. Julia Gorham is the owner of Fields Montessori in Parkmore, Sandton, Johannesburg.